“Dark Tower” (Barely) Rises Above Another Medicore Boxoffice Weekend, “Dunkirk” Keeps Trying to Rescue Summer, and Next Up: a Creepy Doll, YA Angst and a Bag of Nuts. This Week at the Boxoffice. First things first. How bad was this weekend vs. the same one last year? We were down a whopping 45% against the same weekend in 2016 when “Suicide Squad” opened to USD $133 million. This weekend’s boxoffice “winner”, “The Dark Tower” could only muster 1/6th of that total. Yikes. Here’s a further thought-there have only been two weekends this summer where attendance was up on a year to year comparison for the same week in 2016. And one of those was only up 3%. OK, on to the specifics. The marketing department at Sony must be thinking, “Hey, what’s all this fuss about Rotten Tomatoes?” Last week their “Emoji Movie” defied critical cudgeling to attract USD $24 million worth of unsuspecting toddlers and their apparently illiterate parents and this week they were able to convince enough moviegoers that the score of 18 listed on Rotten Tomatoes was for a different “Dark Tower” movie. That’s the only explanation for a movie that is based on an inspired literary work, by Stephen King no less, winning a summer weekend (albeit with just USD $19 million) with these kind of ghastly reviews. As always in this column we like to publish our favorite quote of the week and this week’s champion is Mike Ryan from Uproxx who summed up “The Dark Tower” by simply saying, “astoundingly awful!”. Though last week’s winner Johnny Oleksinski from the New York Post came in a close second in hilariously describing Matthew McConaughey as looking like a “fatigued Wayne Newton”. It’s not often the Vegas lounge lizard is referenced in a movie review unless the New Beverly is running a midnight showing of “The Adventures of Ford Fairlane”. A straight B Cinemascore doesn’t help the long term playability of the film either. Look for a drop of at least 60% this coming weekend. Overseas, “The Dark Tower” debuted at USD $8 million in 19 markets, the largest of which was Russia. Most of Europe and Australia roll out this coming weekend and next and South America comes on board later in the month. In the Place position this weekend was WB’s “Dunkirk” which just continues rolling along, thanks in large part to an older demographic showing up on non-opening weekends, as they are prone to do. The movie fell only 34%, pulling in another USD $17 million for an overall domestic cume of USD $133 million. What will also help extend the playtime is that the film will continue to have the Imax landscape to themselves throughout the month of August. Hats off to LP, Ross, Greg and everyone at newcomer Aviron who opened their Halle Berry thriller, “Kidnap”, to a very respectable USD $10 million. The film has had multiple release dates in the past year or so (along with two different distributors) and Ms. Berry, as documented here last week, hadn’t starred in a film for several years, yet opening their company’s first film to double digits has to be considered an accomplishment for Aviron. The RT score of 40 feels like “To Kill a Mockingbird” compared to the 18 for “Dark Tower” and the film garnered a passable B+ Cinemascore. As with most of these late summer thrillers though, look for a drop of 55-60% this coming weekend, if not more. Annapurna’s first title, “Detroit”, received critical and audience accolades (89 RT score, A- Cinemascore) but strangely could only manage USD $7 million in its opening stanza. Perhaps the film and the aforementioned “Kidnap” were going after too similar of an audience or maybe the first week of August wasn’t the right time for such a serious film. Broad Green laid off its production department last week but indicated the cuts would not affect their Distribution and Acquisitions departments. The last in-house title in production will be this November’s “Villa Capri”. In one of the odder release schedule moves, Universal moved “Pacific Rim: Uprising” from next February 23rd (a date that only had CBS’s Helen Mirren horror/thriller “Winchester” on it) to March 23rd which currently has four major studio releases on it. Paramount quickly swooped in an claimed the 2/23 date for its Natalie Portman starrer, “Annihilation”. “Wolf Warriors 2” crossed the USD $400 million threshold this weekend to become the #2 movie ever in China. It now sets its sights on “The Mermaid” and its USD $527 million. Here in the States the film has grossed a little over $1 million in 30+ runs. Nevertheless she persisted. “Wonder Woman” will pass USD $400 million on Monday and is the summer’s highest grossing film. It is also on its way to passing the USD $800 million mark worldwide. “An Inconvenient Sequel: Truth to Power” continues its expansion this weekend to 500-600 theatres. “Annabelle: Creation” (WB)—OK see if you can follow along with this at home. “Annabelle: Creation” is the fourth film in the series of “Conjuring” films and is the prequel to 2014’s “Annabelle”, neither of which, obviously, have Conjuring in their titles. You still there? Good. “Annabelle” director John Leonetti and stars Annabelle Wallis and Alfre Woodard are not back this time (remember, it’s a prequel) but director David Sandberg has evidently made a terrific little horror film. The movie was a perfect 15-for-15 on Rotten Tomatoes at last check. The Verdict: The first “Annabelle” opened to a snappy USD $37 million a little over three years ago and “The Conjuring” films do a ton of business so look for solid returns this time out as well and there hasn’t been a successful, wide appeal horror movie this summer. We’ll guess a wee bit less than last time but USD $27 million will be enough to win the weekend handily and watch for the film to end up around USD $60-65 million here in the States and USD $140-160 million overseas. Side note, the film opened #1 in Italy this weekend for whatever that means. “Nut Job 2: Nutty By Nature” (Open Road)—I do have to hand it to the folks at Open Road, that’s one of the funnier sequel titles in some time. 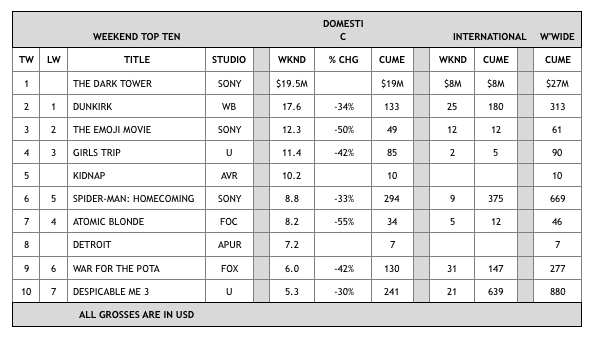 As with “Annabelle” this is a sequel to a 2014 feature, “The Nut Job”, which opened to $19 million in January of that year, ending up at USD $64 million domestic and USD $56 million internationally. Sadly, Liam Neeson is not back but NJ1 voices Will Arnett, Katherine Heigl and Maya Rudolph are and Jackie Chan comes along for the ride. The Verdict: Probably will battle for the Summer Rotten Tomatoes Championship (and not in a good way) but it really doesn’t matter (see “The Emoji Movie”). OPR is hoping that youngsters will want one more visit to the multiplex before school starts and this is harmless fun for that rather nondiscerning crowd, especially with “the Emoji Movie” starting to fade. USD $15 million. “The Glass Castle” (Lionsgate)—Jeannette Walls’ 2005 memoirs, “The Glass Castle”, have been turned into a feature length film starring the week’s best cast, bar none. Brie Larson, Naomi Watts and Woody Harrelson star in this story of a young girl coming of age in a dysfunctional, poverty stricken family. The Verdict: Despite the cast, interest is fairly low and the subject matter is about as light and summery as a 15 ton anvil. LG is only going 1,500 runs. USD $4-5 million. “Toilet: Ek Prem Katha”—This is one of the most anticipated Bollywood films of the year and in case you’re wondering if my autcorrect was having acid flashbacks this morning, yes that is the title. And just to prove it, here’s the film’s ad tagline…”What Happens When Two People In Love Cannot Be Together Because of the Lack of a Toilet in Their House?”. This could only happen in India. Or West Virginia, I guess. On the Event Cinema front, this week US Moviegoers have an encore of “Dixie Chicks Live”, the animated title, “Mune: Guardians of the Moon” and the biggest event of the week on the domestic front, “Big, Loud and Live 14” which is a drum corp competition. For anyone outside the US who thinks I’m kidding, I’m not. These DCI’s do a ton of business Stateside. Going from the ridiculous to the sublime, overseas moviegoers have Trafalgar Releasing’s Royal Shakespeare Company’s performance of “Titus Andronicus” in cinemas on Wednesday night.